Azure Automation has the ability to integrate and automate processes across Azure and on-premises environments using a hybrid worker. This hybrid management capability has been extended to now deliver an automatic response to events in your datacenter using watcher tasks. Look for new files that arrive in a folder and take action based on the content of the files. Monitor for new requests in SharePoint and fulfill the request using an action runbook. Watch for new email in an Office 365 folder and escalate to a ticketing system. Monitor ITSM systems for incidents or requests and respond automatically. Watch for alerts generated in a monitoring system and perform remediation tasks based on the alert type. 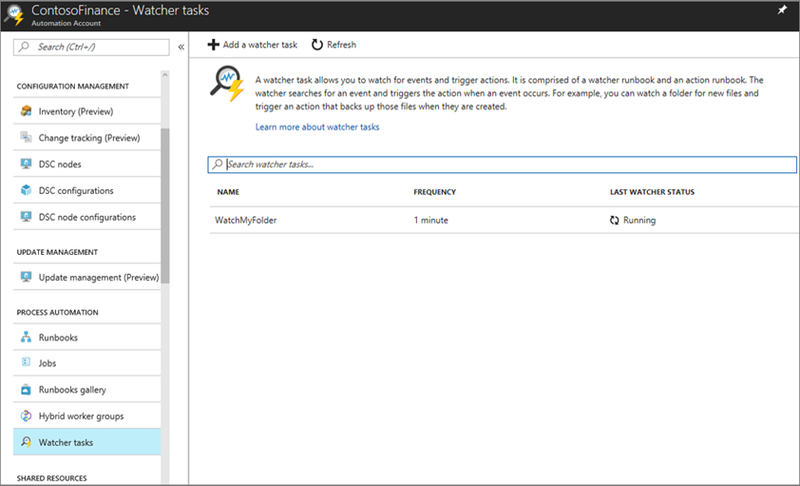 Watcher tasks can be authored for specific needs in the organization by using the extensive PowerShell modules available from Microsoft, partners, and customers. These modules can be imported from the PowerShell Gallery to integrate into existing systems to watch for events. Custom integration can be written in PowerShell to connect and monitor systems for actions to take. You can get access to this new functionality from the Azure Automation account. Watcher tasks consist of a watcher and action runbook that are authored in PowerShell and run on a Windows hybrid worker.